Stay at this 100% smoke free El Cajon, California hotel located minutes away from downtown San Diego and southern California attractions. Guests staying at the Best Western Continental Inn will find everything they need to ensure a relaxing and enjoyable stay in southern California. Centrally located to the Interstate 8, this 100% smoke-free El Cajon hotel boasts 95 newly appointed guest rooms and suites as well as kitchenette rooms. Each spacious room features cable satellite television with HBO and free high-speed Internet access. Begin each morning with a complimentary full breakfast before taking advantage of other hotel amenities or exploring the San Diego area. Enjoy amenities such as an outdoor swimming pool, spa, business services and meeting facilities accommodating up to 60 guests. 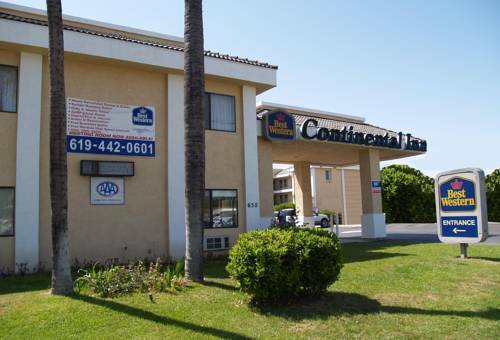 The Best Western Continental Inn is conveniently located near all attractions in the San Diego area. Less than 20 minutes away, guests will enjoy a relaxing day at the beach or a fun filled afternoon at SeaWorld . The San Diego Zoo and Balboa Park offer fun for all ages. Old Town San Diego presents a look back in time to the early days of the gold rush in southern California and the beginnings of San Diego. Guests will also enjoy gaming at nearby Viejas, Sycuan and Barona Casinos; shopping at Grossmont Center or Parkway Plaza which offer a wide variety of shops. San Diego State University is also only six miles away, making the hotel ideal for guests visiting students. The friendly, helpful staff at the Best Western Continental Inn is ready to ensure a fun filled memorable stay in El Cajon, California. Make a reservation today and save. From: San Diego. Take I-8 east, exit Mollison, turn left. The Best Western Continental Inn is on your left. From: Arizona/El Centro. Take I-8 west, exit Mollison, turn right. The Best Western Continental Inn is on your left.